Today, more and more of what we do and interact with revolves around tech. That’s why it’s imperative for today's kids to know what’s expected of them at a later stage in their working lives. The premises for this aren’t always available in school and Quinyx has, because of this, coordinated NOX Academy in collaboration with NOX Consulting. The focus of NOX Academy is to inspire youth to use technology and to use programming as a tool for creativity. As a result, from an interview among other things that Quinyx’ founder and CEO Erik did last fall, where he talked about the importance of programming classes in school, we have taken matters in our own hands and initiated a partnership with NOX Academy. The pace just isn’t moving fast enough when it comes to reforming schools, so we want to make a clear effort to speed up the process. The purpose is to encourage an interest in programming from an early age and make it fun and accessible. The education is open for everyone with different degrees of difficulty depending on the participants previous knowledge. There are also various length of courses, ranging from everything from a couple of hours to a whole week. The day at Quinyx was filled with a lot of activities relating to programming and discovering what can be achieved through teamwork. They have also been given an insight to what a day at a tech company looks like. 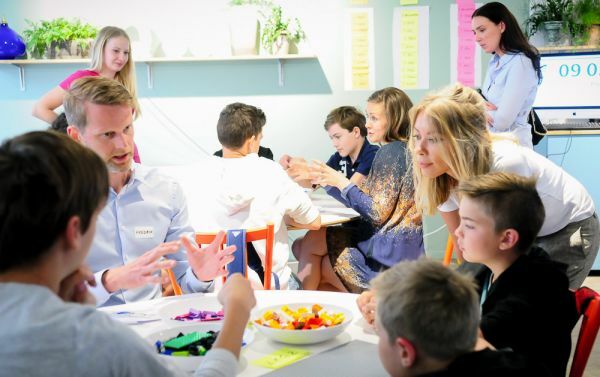 Youth relation to technology and programming has always been something that Erik Fjellborg, CEO and founder of Quinyx, feels very committed to. Also included in the day was a tour of the office, introducing participants to various departments, and a Lego workshop which split the group into teams to work alongside a Quinyx Project Owner while they constructed a Lego city using Scrum - an agile development methodology common in tech companies, where conditions may change at a moment’s notice. After completing three sprints with their Quinyx Project Owner, it was time for the groups to present their cities and discuss how they think the project had gone. NOX has previously visited Spotify, Klarna, KING and Vionlabs and now Quinyx.